Last night when we arrived in Peru, there were people everywhere in the airport…moving an inch we would run into the next taxi driver who was trying to get us in their car. There was no official taxi line, there were no meters in the taxi and it was dark outside. We felt a bit uneasy but finally chose a driver who was very persistent. Once we were in his car and driving the 25 minutes to our hotel in downtown Lima…we realized the area we were in was far from a good neighborhood. There were bars on the windows, abandoned buildings and people just hanging around on the streets. The air was so full of fumes…it was hard to breathe in the polluted air. The taxi driver was very friendly and we chatted with him about the area and his daughter. He told us the area and Lima were not safe…I believe he used the phrase, “there are many pistoles” (guns). We arrived at our hotel, checked in and got settled into the room. It was midnight so we went straight to bed…we made sure the door was locked! After sleeping in from our long flight, we hit the city. There were quite a few people on the busy streets, and the sidewalks were a bit tired…making it important to watch our steps over and around broken cement. We noticed again the lack of clean air…it smelled of old car exhaust with no breeze because of the city buildings. We followed the city map up the street to the two main squares. We took pictures of some of the buildings. There was some great architecture when we looked hard enough amongst the city grime. We did see their “changing of the guards”. There was a crowd of people trying to watch and many “policia” standing around, some with their shields just in case there was a problem. We continued walking through the city looking in the various stores for a camera battery. We realized we had left it in the wall of the hotel in Atlanta. No one seemed to have the charger…not good. As we continued our search, we ran into the Casa de la Gastronomica. It was a building full of both past and current facts on the various foods in Peru. They had statues and signs and maps of information. We walked through it for a while trying to familiarize ourselves with foods of different regions. We saw a grocery and went in to grab some bottled water. As we were standing in line to pay, we noticed each checkout counter was piled with cartons of eggs…the way you would see magazines stacked right before checkout. We thought it was interesting the eggs here aren’t refrigerated. After much more walking around, we found our way back to our hotel without a camera charger. If we can’t charge the battery we can’t take pictures. We were starving and feeling a bit sick from the pollution but asked the concierge if he knew of any battery places. He helped us look some things up on the Internet and then back out we went…a cab dropped us off at a cannon store but they didn’t have the charger either. We went to the next place which was a “black market” type place with tons of vendors selling all kinds of electronics. We bargained back and fourth and finally found one. Back at our hotel and ready to eat anything at that point, we ran upstairs to plug in the charger to make sure it worked…it didn’t! Back we went…the vendor actually gave us our money back and we bought a more expensive one from another guy. That one ended up working. We sat down to eat at the hotel restaurant for dinner. We ordered a couple authentic Peruvian dishes. One was a beef stir-fry with rice and peppers in a salty brown sauce and the other was a chicken in a cream sauce with big corn kernels and rice. We scarfed our food down and went upstairs to pack and get to bed. Tomorrow we fly into Cusco which is where our 4 day Machu Picchu hike departs. Hey Alexis! How is Seattle?? 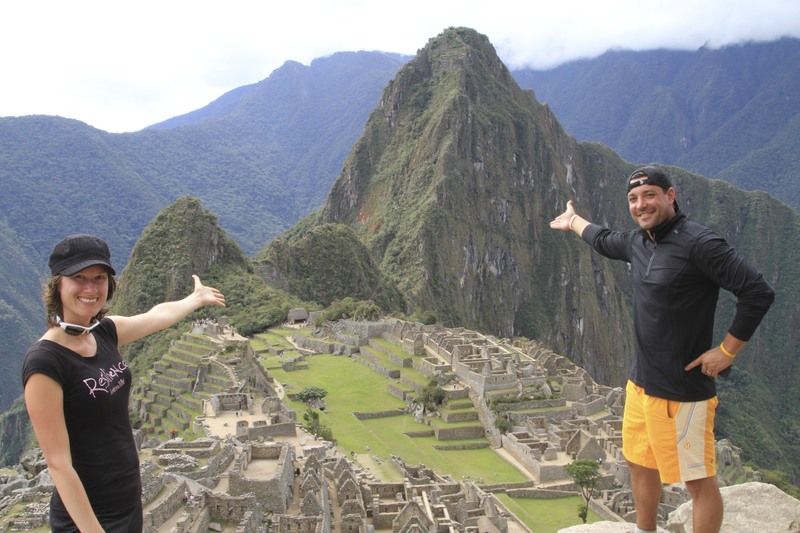 One of our favorite spots…we could end up there.. Machu P was so amazing, a definite highlight of our trip so far, make it happen-you will LOVE it.